Is it a do-it-yourself project? The short answer is NO! Before I go any further I have to confess that I am a weekend warrior, and I love doing projects around the house. There isn’t much I won't try to tackle myself, so making the statement that stamped concrete is NOT a DIY project doesn’t come lightly from my lips. One of the main reasons I preach that stamped concrete needs to be left to the professionals is that you only get one chance to get it right. Concrete, especially stamped concrete, is unforgiving and expensive in terms of materials and time. Unlike carpentry, plumbing, or electrical work, concrete doesn’t come apart and you can't come back tomorrow to finish if you run out of time or patience. This often includes 2 to 4 inches of sub-base material or stone that needs to be properly spread and compacted. This requires proper form materials and an understanding of elevations and slope. If the proper slope isn’t maintained on concrete flatwork, you end up with puddling or standing water issues known as "bird baths". As with most everything concrete, these low spots are very difficult to repair, especially if any aesthetic value is desired. Standard concrete weighs about 150 pounds per cubic foot. Unless you are lucky enough to have a job where a ready-mix concrete truck can pull right up to the formed area, you will be moving concrete via wheel-barrow or paying someone to pump it for you. Also consider that most ready-mix companies charge penalties if the truck sits at a job site for longer than 30 to 60 minutes. Most do-it-yourselfers aren’t familiar enough with the components of concrete mix, what admixtures to use and proper slump consistency. Modern concrete is a high-tech material that contains more than sand, stone, cement and water. The water-to-cement ratio is the biggest issue with color development as well as surface strength and durability. 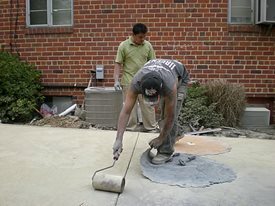 An incorrect ratio can lead to washed-out color and spalled concrete within the first year. Environmental conditions need to be considered as well, not only on the day of the pour, but also long term. 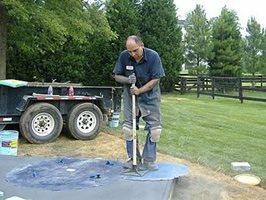 Any professional concrete installer will tell you that placing and finishing plain concrete is as much of an art as it is a technique. It takes years to even get a handle on the basics, let alone get good at it. Take it to the next level and add in stamping, and you just increased the learning curve by another 3 to 5 years. Placing concrete, while often overlooked, is critical. Improperly placed concrete can cause failure within the first year. With the growth of integrally-colored concrete and the ability of most ready-mix companies to provide it, ordering and getting colored concrete has become the easiest step involved. However, the factors involved in making sure the color turns out correctly can play havoc with the job. Instead of listing all the potential issues, spend a few minutes in the technical troubleshooting section or look through these common coloring issues to see for yourself. The most unforgiving part is the actual stamping itself. A good stamped concrete job looks good, while a fair-to-poor stamp job looks horrible. Dealing with poor placement or poor finishing is one thing, but if the imprinting process isn’t done properly, it’s extremely difficult and expensive to repair. Each stamp fits together a certain way, and once you start stamping you can't go back and start over if you mess up the pattern or get off line with the texture. Stamped concrete is also no different than most projects; you have to sweat the details. Having the right detail tools for the pattern and texture are critical to ending up with a good stamp job. The stamps themselves can cost thousands of dollars if you buy them and hundreds if you decide to rent. After the actual stamping process is completed, the job isn’t done. In fact, the curing, cleaning and sealing processes typically cause more issues than the previous steps outlined above. I’m all about the bottom line, and the bottom line is that stamped concrete is not a DIY-friendly project. Don't be fooled that you are prepared and ready to stamp just by watching a 5-minute how-to video, as these provide just enough information to really get you in trouble. My advice is plain and simple: Stamped concrete is better left to the professionals. For those DIY'ers still brave enough to want to try stamping concrete themselves after reading my attempts to talk you out of it, here's an overview of the steps involved when stamping concrete: How to Stamp Concrete.